Cupro-Nickel or Copper-Nickel is formed by alloying copper and nickel thus making it highly resistant to corrosion in seawater. Jaydeep Steels is a trusted dealer and exporter of Cupro Nickel Sheets & Plates that offer various other properties like good tensile strength, excellent ductility upon annealing, thermal conductivity, and much more. Cupro-Nickel Sheets are the most viable solution for seawater corrosion and bio-fouling. They are used in seawater piping system, heat exchangers, hydraulic lines, and fish cages. Cupro-Nickel Plates are basically metal plates with non-ferrous properties that have high-strength and toughness, excellent corrosion resistance, and high-temperature resistance. 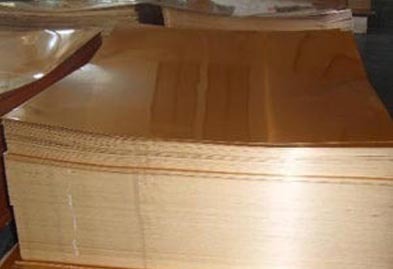 Copper Nickel Hot Rolled Sheets Plates are prepared in a semi-fabricating plant, after it is preheated between 850 and 1100°C, in a sulfur-free atmosphere. 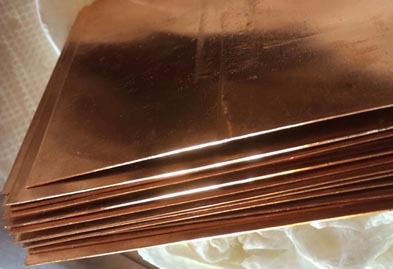 Copper Nickel Cold Rolled Sheets & Plates have better finish and tolerances. They are prepared by either cold-rolling or annealing. Less is the nickel content, better will be the cold-rolling. Cupro-Nickel Galvanized Sheets & Plates are highly resistant to rust and corrosion. By coating the object with a layer of zinc, oxygen, and water is restricted from reaching the metal underneath, thus preventing corrosion. Cupro-Nickel Polished Sheets & Plates have a highly reflective surface cause of their smooth and super-fine surface finish. They are specifically used for decorative purposes. Cupro Nickel Perforated Sheets have different types of perforations or holes like round, square, hexagonal, etc., on the surface of the sheets. These perforations help provide extreme resistance to moving sea-water. Their applications include Marine Equipment, Filtration screens, and Sieves, Chemical Industry, Wastewater treatment, Seawater desalination. Cupro Nickel Chequered Plates are used for providing resistance to erosion, and stress-cracking. We supply all sorts of brass sheets and plates products with a different range of sizes, wall thickness and dimensions to cater all needs of industries at most competitive prices. Kindly contact us today to request a free quote! Jaydeep Steels stocks a wide range of materials and grades. Below are a list of all standard cupro-nickel sheets and plates materials and grades we stock. Our experienced team of metal experts will get you the metal you need when you need it. Call us today for your Cupro-Nickel Sheet & Plate Needs!